Featured image: Western bumblebee photo by Steve Amus, USDA. Four commonly used neonicotinoid pesticides can harm bees and other pollinators, according to a new analysis by California’s Department of Pesticide Regulation. The study found that current approved uses of the “neonics” on crops like tomatoes, berries, almonds, corn and oranges exposes bees to levels of the pesticides known to cause harm. 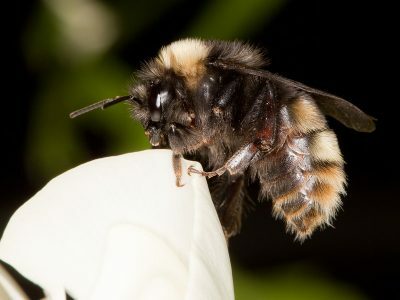 Recent analyses by the U.S. Environmental Protection Agency identified harms to bees and pollinators from neonics used on cotton, citrus and several other fruits. But California’s analysis indicates neonics can cause much broader harm, including to pollinators commonly found on many types of vegetables, cereal grains, tree nuts, fruits and tobacco. One of the most important findings of the new California analysis is the discovery of the high risk to bees posed by use of two neonicotinoids, thiamethoxam and clothianidin, on cereal grains like corn, wheat, rice and barley. Late last year the U.S. EPA announced it would consider an application from Syngenta to spray thiamethoxam directly on 165 million acres of wheat, barley, corn, sorghum, alfalfa, rice and potato. Earlier this year California announced that it would no longer consider any applications by pesticide companies that would expand the use of bee-killing neonicotinoid pesticides in the state. Earlier this year, the European Union banned neonicotinoids for outdoor uses in agriculture. Europe’s decision came after Canada’s pesticide regulatory agency recommended banning imidacloprid, the most widely used neonicotinoid, based on demonstrated harms to aquatic ecosystems. As other developed nations further restrict the use of these poisons, the U.S. EPA has largely ignored the risks. Last year a rule that would have placed limited restrictions on neonics when commercial honeybees were present in fields was changed from mandatory to voluntary. The U.S. EPA is currently in the process of reanalyzing neonic impacts to humans and the environment and is expected to re-approve the pesticides by the end of 2018. California’s pesticide office is in the process of identifying mitigation measures to reduce the risk of neonics to bees, which the agency says will be finalized in the next two years.